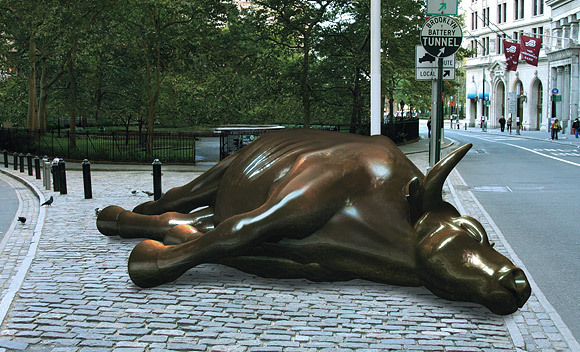 This picture signifies the end of the bull market on Wall Street and the start of a less successful economic era. In this picture we see a very famous street in New York City that usually has a golden bull looking as if it is about to charge. The bull that is normally charging is now lying on it’s side as if it were dead. The bull is gold and on a cobblestone section of road just outside of a park. There is a sign pointing to the Brooklyn Battery Tunnel and city buildings down the road.The trees have very green leaves and the park is sectioned off by a black fence. The golden bull is the first part of this picture that catches the onlookers eye. It is gold to signify the money that runs through Wall Street. Normally the bull looks as if it is charging. This is because a healthy market that is growing is called a bull market because it moves forward like a charging bull, but now the bull is lying on its side as if it were dead. This signifies that the markets are no longer bull markets, that era is over and the economy is no longer growing the way that it used to be. The park behind him is a lush green which usually represents spring and new beginnings. The time of year is showing that this is a new beginning, not necessarily a good one, but still it is new. Above the bull is a sign saying Brooklyn Battery Tunnel and points in the direction that it is. This sign shows people a way out. That they should leave behind the markets and give up on them while they still can. It states that people should leave in some way or another. The sign points down the street where a white building stands, a building that is meant to signify purity, innocence and sanctuary. The picture almost screams, if you follow this sign you will be saved from the fate this bull met, financial death. Featured Image. The American. American Enterprise Institute, n.d. Web. 31 Oct.
At first glance, the above image shows a man with a poised look on his face. He is calm yet determined. He is wearing a gray suit, showing that he probably works at a typical American desk job. That suit shows that he is a normal American, nothing particularly special about his life. However, his white dress shirt is ripped open to reveal what looks to be an American flag shirt or uniform. In the background a deep and powerful red background with streaks pointing outwards. With a little bit of context, this is a direct satire of Superman in the context of the idea of American Exceptionalism. While Clark Kent was an average person, Superman was not. The superman series showed that an average person could be important. This image pokes fun at the idea that average Americans are all superheroes through the lens of superman: a superhero most people are familiar with. One of the major themes that this image drives home is that there is a false sense in American’s minds that our country is infallible. That the American Dream allows all average people to have picture-perfect lives as they follow the idea of pursuing life, liberty, and the pursuit of happiness. In reality, the United States is not the richest country per capita nor do we have the “happiest” country. There is an endless list of things that we are not the best at, and yet we still want to believe we are. That simple truth begs the question, “why do people still believe we are the best when the facts aren’t there to support that idea?” While there are probably many reasons, it seems that people are holding onto a time where we were the greatest country. We were once great and we certainly have the potential to be great again, but as of now we aren’t. The facts don’t support American Exceptionalism, and yet it still is an ever-present part of American culture. This image encourages the viewer to take a hard look at the culture of American greatness. What makes us so special? There are tons of other countries around the world that are happier, better educated, healthier, richer per capita, etc. There is no reason for us to think we are the best. The sooner we accept that fact, the sooner we can get back on track to actually being the great country we can be. Nick Anderson’s NCAA to Athletes: You’ll Thank Us Later represents the cunningness of the NCAA as they take the extensive revenues from student-athletes and hand them over without opposition to the universities they play for. The cartoon features three figures that represent the main players in the business deal that is college athletics. The student-athlete is a basketball player who appears confused while the NCAA representative tells him that the institution is protecting him from the corruption of money. The NCAA representative has a big smile on his face as he looks up at the college athlete when telling him this lie. In the background, there is a huge dumpster full of cash that college athletics are creating, and a man with the word “universities” across his shirt is sitting in the middle of the cash pile, celebrating the amount of money the college is making due to intercollegiate athletics. When interpreting this cartoon, the facial expressions of the three figures provide perfect depictions of the controversial tradition of the economics of NCAA athletics. As the NCAA businessman tells the student-athlete how they take his money to “protect” him, it’s evident in his facial expressions that he is undoubtedly trying to convince the athlete of something that is not true. The trickery of the NCAA is portrayed in this figure because he shows how the NCAA feigns a close relationship with student-athletes, and exemplifies how the institution continually coerces confused student-athletes to give up their money without a fight. The perplexed athlete seems willing to give up his earnings because he is unaware that the NCAA is not actually protecting him from corruption, but rather taking advantage of his uncertainty to generate revenue for the NCAA and universities. In the background, the figure representing the universities is literally “rolling in the cash”, all thanks to the student-athletes talent and entertainment. The facial expression of this figure is one of pure bliss, and it is inferred from this image that the only thing the universities seem to care about is the money they earn from athletics. Overall, in the case of this cartoon, the figures represent the grave triangle of college athletics: the disoriented athlete, the cunning NCAA, and the selfish universities. This drawing epitomizes the unjust circulation of money produced by student athletes, showing that the money ultimately ends up in the hands of greedy universities who exploit their athletes. Is the iPhone still revolutionary? 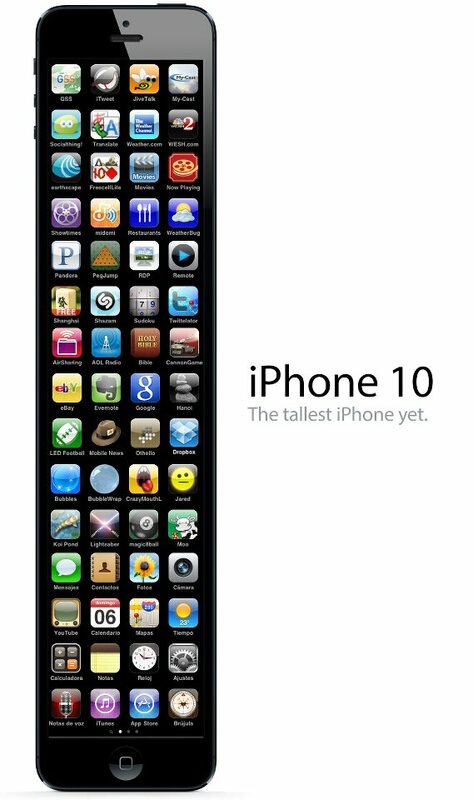 This image represents a parody of the future of the iPhone as an insanely tall phone that has not gained any width since the iPhone 4S. The image represents an iPhone that looks more or less exactly like the 4S and the 5 except it’s incredibly tall. Apple was heavily criticized for it’s release of the new iPhone when the device did not look much different than the previous generation, only taller. A decent percentage of consumers, especially on online forums and debates on the apple support website, have complained about the lack of ingenuity and originality that apple has put forth in it’s new product. Mostly the burden has fallen upon Tim Cook (Apple C.E.O.) to take on the judgements as people blame him (incorrectly) for the lack of ingenuity. Tim Cook is mostly an overseer as far as the engineering and the design of the actual products go. He can make the final judgement but he cannot design the device itself. Nevertheless Apple has taken a lot more criticism than usual for this release. Apple on the other hand never truly responds to these judgements as they are a company that aren’t truly based on consumer opinions. And so for that has worked for them. Apple has always believed that it is unnecessary to improve upon perfection. The iPhone 4 was already a pretty amazing product. In design it is a jewel and that looks amazing and comfortable fits in your hand while the software specification provided dual core chips that pushed the performance that we see com through on a mobile device. Apple doesn’t need to change something that is selling incredibly well and has an amazing consumer satisfaction rating. That is why the iPhone 4. 4S, and 5 don’t particularly look so different. Instead of focusing on changing something that is incredibly well reviewed, Apple focuses on improving the details that can push the phone closer to perfection while still keeping it a beautiful device that fits well in our hands. Posted in ENG110Curation3, ENG110F12, SanchezJulio, Uncategorized, Image format on October 4, 2012 by maxeljulio.